Yesterday I introduced you to the wonderful world of RSS feeds, which put all your favorite sites under one easy-to-peruse roof--namely, Google Reader. 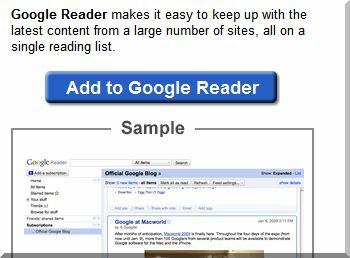 But without a doubt my favorite option is the Google Reader bookmarklet. One click and presto: You're subscribed to whatever site or page you're viewing (as long as it has an associated RSS feed). 2. Click the Goodies tab, then scroll down until you see Subscribe as you surf. 3. Drag the Subscribe... link to your browser's bookmarks/favorites bar. That's all there is to it! When you click the bookmarklet (so named because it's a bookmark that performs a special function, rather than just directing you to a page), you'll be taken straight to Google Reader. There you'll see a few key stats about the feed (such as average number of posts per week) and a Subscribe button you click to complete the process. Okay, so this actually requires two clicks altogether, not one. But to my thinking it's still the fastest and easiest way to subscribe to Google Reader feeds. Give it a whirl!